Most grep tools can only search for a single regular expression. With PowerGREP you can use up to five sets of search terms. Each set can use an unlimited number of regular expressions. Though this sounds complicated, it actually makes PowerGREP much easier to use. With PowerGREP you can use multiple simple regular expressions. A simple grep tool forces you to use one complex regex, if it can do the job at all. 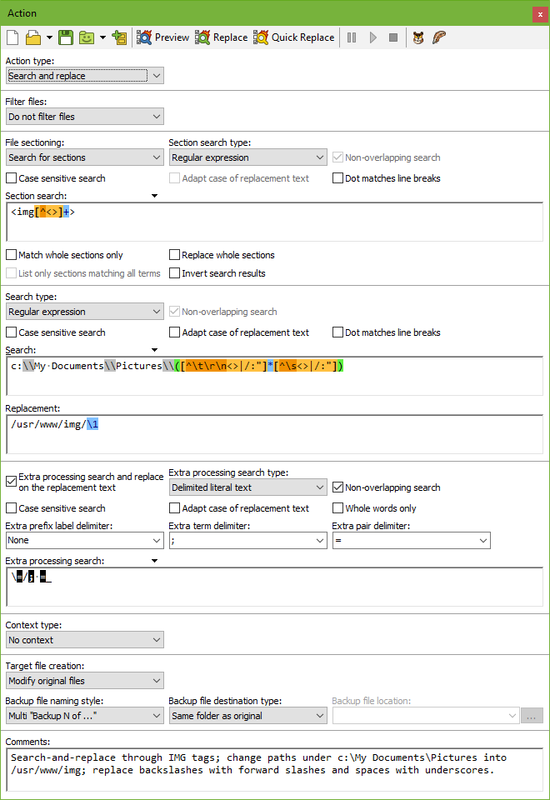 The main search, search-and-replace or data collection action. Extra processing applied to the substitution text in a search-and-replace or data collection action. 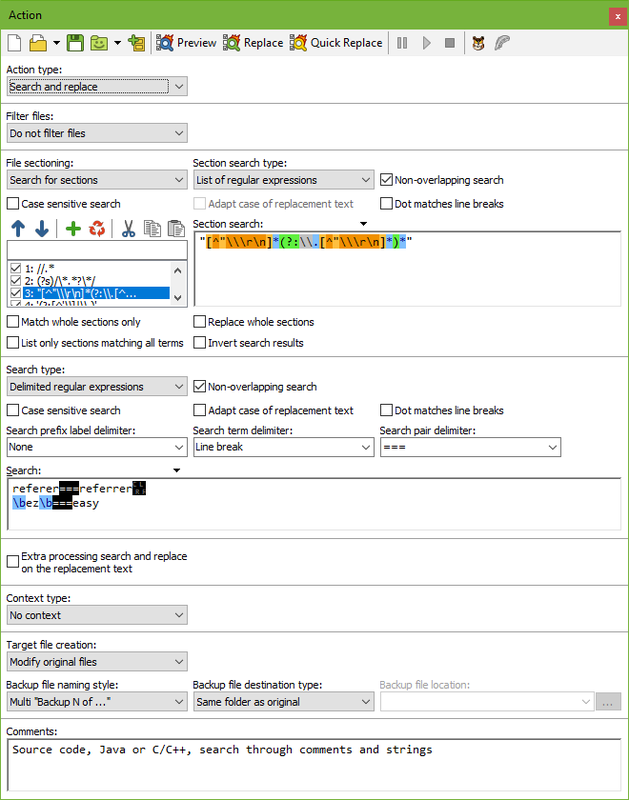 File sectioning to limit the search to specific parts of each file, or to split files into records or sections. Filter files to skip files that do or don't contain certain search terms. Context needn't be line-based. Use regular expressions to see the most meaningful context for each search match. Collect as much or as little context as you like. In the first screen shot, PowerGREP is set to use a delimited list of regular expressions to perform two substitutions at once, replacing "referer" with "referrer", and "ez" (whole word only) with "easy". A separate list of four regular expressions is used to restrict the search to comments and strings in Java and C++ source code files. One for single-line comments, one for multi-line comments, one for strings, and one for characters. All this is very straightforward in PowerGREP, but impossible with any other grep tool. Suppose you want to convert image file references from local Windows folders to UNIX server directories. Trying to do this with a basic grep tool that can use only a single regular expression would require a very complicated and incomprehensible regex. With PowerGREP it's much easier to use three simple regular expressions: one to limit the search to IMG tags, one to substitute SRC attributes in the IMG tags, and one to covert Windows back slashes to UNIX forward slashes in the SRC attribute paths. The second screen shot shows this. No other Windows grep tool offers you such flexibility in combining multiple regular expressions. It's up to you what happens when you search-and-replace "classification" with "category" and "cat" with "dog" on the string "The classification for cat is mammal." If you turn on non-overlapping search, "classification" is replaced with "category" and "cat" with "dog", resulting in "The category for dog is mammal." If you turn off non-overlapping search, replacements will cascade. While undesirable in some situations, the cascade enables you to perform some very powerful data conversions. In our simple example, the first substitution would result in "The category for cat is mammal". If we're not restricting the search to whole words, the second will result in "The dogegory for dog is mammal."